Nobleborn Prince Theodore (Feodor) of Novgorod, the elder brother of Saint Alexander Nevsky, was born in the year 1218. His princely service to his native land began at a very early age; already in 1229 both brother had been left in Novgorod by their father Yaroslav Vsevolodovich as representatives of his power. But not even a year passed before the young princes had to quit Novgorod: the turbulent Novgorod people in their "veche" ("government council") decided to invite another prince. But in the very next year, 1230, during a time of famine and epidemic, the Novgorodians again invited Yaroslav. On 30 December 1230 it became the fourth time that he sat as prince in Novgorod, but he remained in the city for only two weeks, when he seated there his sons and went off to Pereyaslavl'-Zalessk. In 1232 the fourteen year old Theodore was already summoned to serve God not only in prayer, but also by the sword: he took part in a campaign of the Russian troops against the pagan Mordovian princes. In the year 1233 at the wish of his father he was obliged to enter into marriage with the daughter of the holy Prince Michael of Chernigov - Theodoulia. When the guests had already gathered at the wedding feast, the bridegroom suddenly died. After the unexpected death of her betrothed groom, the princess left the world and was tonsured in one of the Suzdal' monasteries, famed in her monastic efforts as the Nun Evphrosynia of Suzdal' (+ 1250, Comm. 25 September). 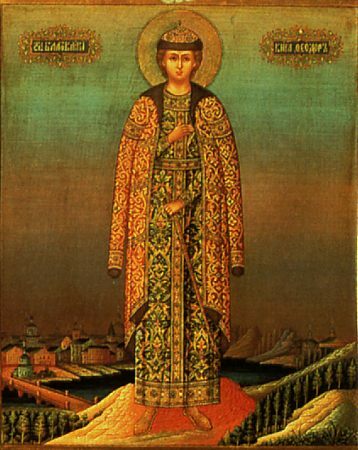 Saint Theodore was buried in the Yuriev monastery in Novgorod. In the year 1614 the Swedes, having pillaged the monastery, broke open the tomb of the prince and finding him whole and undecayed, they made mockery over the holy relics, setting up the body "as though alive" against the church walls. The Novgorod metropolitan Isidor transferred the relics to the Sophia cathedral, where they placed them in a chapel of the holy Prophet John, Forerunner and Baptist of the Lord. The service to Saint Theodore was compiled in the year 1787 by the metropolitan of Peterburg and Novgorod, Gavriil Petrov (+ 1801).